Good morning fellow scrappers! It's my turn over at Berry71Bleu to host this months challenge--the final challenge of 2013! Tsk, tsk, tsk...how can 2013 practically be over already? I seem to find myself in the same boat consistently every time around this year. I officially think that Father Time has decided to be in a mad rush right alongside the rest of us. He needs to take it easy & relax a bit! So we decided that the challenge for the month of December will be a two-part challenge. The theme is 'Joy'. After all, we're in the 'most joyous time of the year'. However, Joy can be interpreted in many ways--it can be an obvious sense of joy that we all share such as family, friends & loved ones or it can be a simple pleasure joy such as that first cup of warm coffee in the morning, reading a book or having your family dog cuddle up next to you! 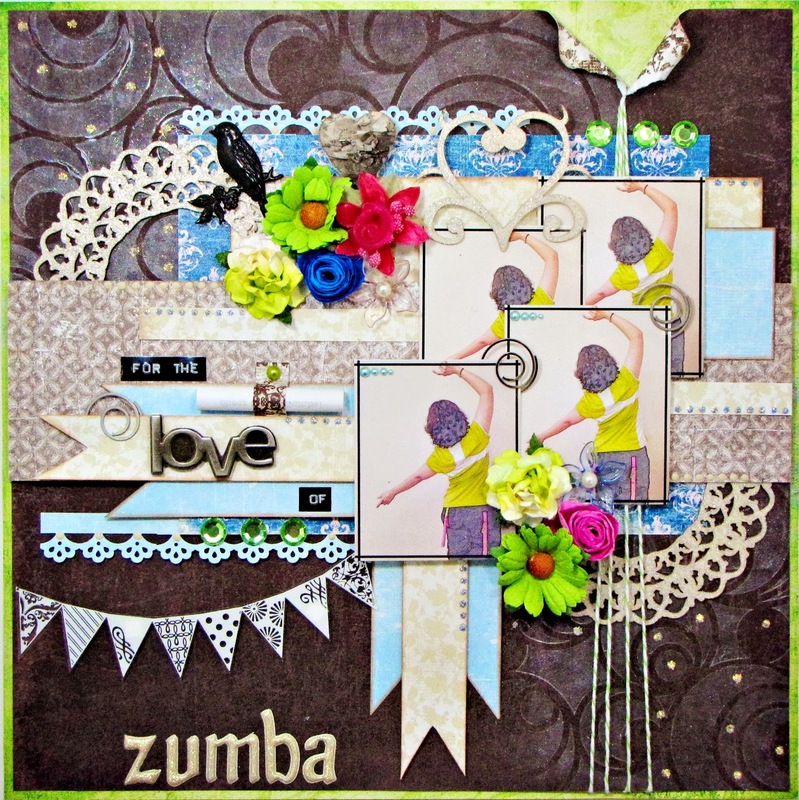 The second part of the challenge is to include journaling on your page. Journaling must be at a minimum 3 sentences long & no cheating! Jotting down places & dates do not count. I want you to document your story & thoughts and explain why the subject you chose brings you joy. When something brings you joy--I find that it's very easy to talk about it. One obvious thing that brings me joy is my family--but I wanted to share a different kind of activity that brings me much personal satisfaction & that's Zumba. I love it & thoroughly enjoy it. It helps me release stress, keeps me & my heart healthy & it keeps my weight in check. Plus I've finally made my Hispanic heritage proud since ever since I started taking Zumba my Salsa & Merengue dancing skills have greatly improved! Before I forget, here's the inspiration board I came up with for the challenge. 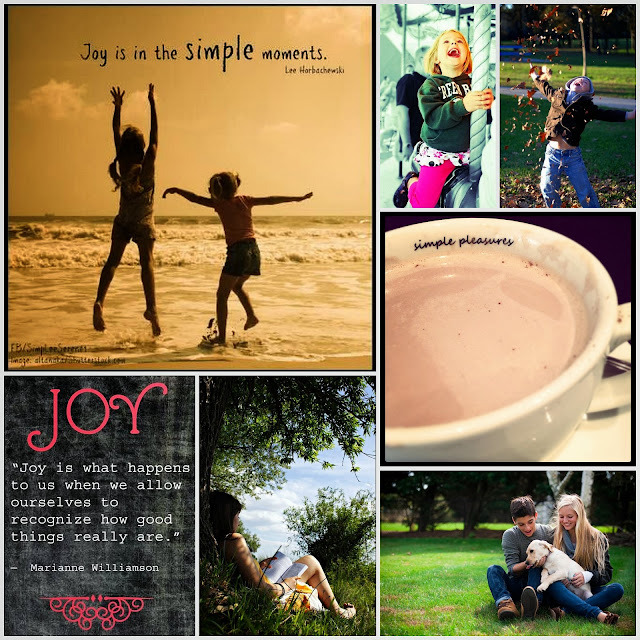 That cup of coffee in the collage is calling me as I type this post up! It's early & I'm in the office--nothing tastes better on a cold early morning than that first cup of warm coffee. In fact I almost chose that as the subject to my page! All papers used are by one of our Berry71Bleu sponsors UHK Gallery. Only the bright green paper you see peeking around the border is not by UHK. I've used papers from their 'Hot & Cold' collection. To get those circles to display lightly along my background I've used a Craters Workshop stencil (Mod Spirals) & a bit of 'Frost' paint by Art Anthology. I just dabbed the paint onto my stencil lightly with a makeup sponge. The paint dries semi translucent when only a little is applied. Here's my journaling. As usual, I've stored it in the form of a scroll. For me, it's the fastest & easiest way to store my thoughts onto my page. I have a tutorial on how I go about making these scrolls here. I've unrolled my scroll here so you can see part of my journaling. All chipboard used is by Scrapiniec. I inked them all with embossing ink & spread a bit of 'Star Dust' embossing powder by Stampendous onto them & heat set them. In person, all the chippies have a nice glimmer & shine to them. The bright fuchsia organza ribbon star flower seen here are items from my stash. I have several of these in different colors up for grabs in my Etsy shop here. I've strung a bit of twine along my page--it's adhered behind the page with a couple of strips of tape. Feel free to stop at the Berry71Bleu blog throughout the month of December to see the other DT's take on this month's challenge. Do play along if you find the time--there are a couple of great prizes up for grabs.